Honda Motorcycle & Scooter India (HMSI) is all set to introduce its new middleweight capacity motorcycle, the CBR650R - in India. The Japanese company recently launched CB300R via the CKD (complete knock-down) route and the company is all set to follow it up with the launch of the 650cc bike. The model, which was unveiled at the 2018 EICMA show in Milan, will replace CBR650F from Honda's sports middle-weight lineup and gets a complete new design that has taken design inspirations from CB1000RR. "After the 2019 global fun model lineup unveiled in EICMA, Honda has now opened bookings for its new middle-weight sports machine CBR650R in India too," HMSI senior Vice President - Sales and Marketing Yadvinder Singh Guleria was quoted by PTI as saying. The new CBR650R is powered by a 649cc liquid cooled four-cylinder, DOHC 16-valve engine that comes with a higher compression ratio thanks to the new intake and redesigned exhaust ports. The power, torque and the rev ceiling have also been increased. The new motor now churns out 95BHP at 12,000rpm and 64Nm of torque at 8500rpm. The engine is mated to 6-speed gearbox assisted with a slipper clutch and Honda's switchable Selectable Torque Control (HSTC). Suspension is taken care by Showa upside-down front forks and a preload-adjustable rear monoshock. The bike comes to a stop via a dual 310mm front discs with Nissin four-piston calipers and a 240mm single-pot caliper rear disc. Dual-channel ABS is kept as standard. The bike rolls on cast aluminium 17-inch alloys that come shod with 120/70-R17 front and 180/55-R17 rear Sportmax radial tyres by Dunlop. 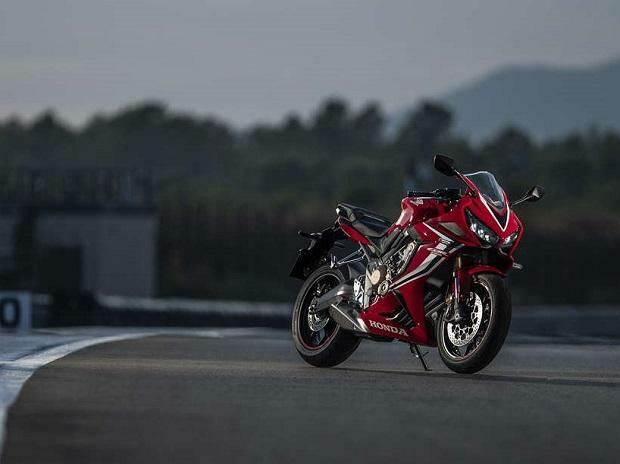 The CBR650R is expected to be priced at Rs 8 lakh (ex-showroom). While the bike comes at a premium than the outgoing CBR650F but the major updates in the CBR6550R justifies the price hike of Rs 70,000. Although, there is no direct rival of the Honda CBR650R, Kawasaki Ninja 650 is it's closest rival in the 650cc segment. However, the Ninja is priced much lower than the tentative pricing of the Honda offering and it remains to be seen how the Indian super bike lovers take the CBR650F replacement. The CBR650R will be available at Honda Wing World dealerships across 22 cities of India and can be booked with a down payment of Rs 15,000. Deliveries of the new bike is likely to begin from April onwards. The success of this CBR650R and the recently launched CB300R will play a vital role in Honda's bid to bring performance-oriented products into the Indian market via CKD route.